When you think about Mount Everest, what do you see? Some may envision the splendor of the world’s highest mountain. Others may picture climbers or snow-capped peaks. Christine Taylor-Butler gives us a new and important view. Her acclaimed book, Sacred Mountain: Everest (Lee & Low, 2009), puts the Sherpa — unsung heroes of the majestic mountain — center stage. Author of more than 40 books, Taylor-Butler has won many accolades for her work. Her picture book, Mom Like No Other (2004), was included in an Essence magazine list of best books for children. Her non-fiction books explore an impressive range of topics such as biography, science, health and space. But with Sacred Mountain, Taylor-Butler brings us a story too seldom heard. With clarity and grace, she explores the mountain’s ecology, history and the lives of the Sherpa — people who call the mountain home. They are courageous guides who make incredible sacrifices for their families. They are parents and children. They are trailblazers and keepers of the mountain, a sacred place. Your wonderful book, Sacred Mountain: Everest, has won great reviews and was named to a mock Newbery list. Congratulations! What inspired the story? I have a soft spot for stories about people and places that aren’t covered in other children’s books. When I look for topics I like to choose paths that are less “traveled.” A good friend and mentor, Bernette Ford, broached the idea of writing about mountains for Lee and Low Books. Everest was an intriguing choice because it is the tallest and so little is known about the people who live in the region. Along with applauding the style of your writing, reviewers have praised the depth of your research. Please tell us about your writing process and journey to publication. Sacred Mountain was harder to research than other nonfiction topics because there isn’t a lot of primary research material that covers the Sherpa culture. Most nonfiction focuses on foreign climbers and the difficulty of climbing the mountain. Little attention is paid to the Sherpa people who literally drag visitors up to the top. I logged hundreds of hours of research before developing an outline. That included watching documentaries, listening to interviews and oral histories, reading through biographies and archived materials. It took close to a year to complete the work. You’ve written many non-fiction books. How was writing this one different? What meant most to you in writing Sacred Mountain? I loved working on this project because the publisher let me go where I needed to go to make the book work. And the photographs really tell a story in themselves. They make the text come alive. I wanted to showcase information that isn’t commonly known in a school curriculum. For instance, the fact that the Himalaya mountain range was formed when the Indian continent slammed into the Asian continent. It pushed materials up from the bottom of the ocean. That is why you find fossils of ancient sea creatures on the top of the mountain. I also read historical accounts of the British attempts to climb the mountain starting in the 1920’s. After several Sherpa were swept away in an avalanche the expedition leader, John Hunt, wrote home to say “Thank God, no British were killed.” It was as if the Sherpa were unimportant and expendable. Even the 1953 expedition that lead to Tenzing Norgay and Edmund Hillary reaching the summit, started with the British forcing the Sherpa to sleep in an unheated barn without food, supplies or bathroom facilities. Their attitude was that the Sherpa would take all the risks blazing the trail, carry hundreds, if not thousands of pounds of supplies across dangerous glaciers and icefalls, and then the British would climb the remaining distance to the summit and claim the glory. I was appalled by the arrogance. I realized that the true story of the mountain was the people who are responsible for the British success in attaining their goals. Why do you think the Sherpa are so often unsung? I think it’s because history books are most often written by those with the most resources to tout their own accomplishments – in this case, foreign expedition leaders and their funders. The Sherpa do not have a written language. Nepal was closed to visitors for many years, so little was known about the people before the early 1900’s. They are Buddhist and as such are very modest. As a result, most books and news articles are about the exploits of foreign climbers and not the fact that it was made possible by a Sherpa guide who blazed the trails, strung ropes, hauled supplies and guided them every inch of the way. Most books relegate the Sherpa to servant status. I wanted to correct that. I’m convinced the person who should be credited with the historic first summit is Tenzing Norgay, the Sherpa team member who saved Edmund Hillary’s life days before. Norgay is the person seen in the first photographs at the top of the mountain. What moved you about their lives? What surprised you? Three things: that the people are willing to take such enormous risks for their children. Think about it; guides are away from their families for months at a time. They risk death when guiding visitors 26,000 feet into the air – all so they can afford to send their children to school. But in the U.S. we have trouble getting parents travel a mile for a parent-teacher conference. We can learn a lot from how the Sherpa face obstacles and where they place their priorities. Prior to the British expeditions, the Sherpa didn’t climb the mountain whose true name is Chomolungma – Goddess Mother of the World. It was the home of their gods – a sacred space that was meant to be undisturbed. They were traders, herders and subsistence farmers. Now they guide climbers out of economic necessity. They seek spiritual guidance at the local monestary and hold long prayer sessions before embarking on the journey. What most surprised me is the strength and resiliency of the people. They have an almost superhuman ability to survive and thrive in that environment. It takes a foreign climber upwards of one to two months to acclimate to the harsh conditions and thin air, and they need specialize clothing and oxygen tanks. Pemba Dorji Sherpa, on the other hand, can climb in eight hours. In the book, you dealt with tough realities like threats to the mountain and the Sherpa people. What troubles you most about what’s happening? What can people do to help? Significant damage is being caused by tourists and climbers. It’s ironic that visitors participate in the prayer service and light sacred fires to request safe passage before climbing. Once on the mountain they focus solely on personal survival. The landscape is now covered with hundreds of tons of trash, human waste, discarded camping supplies and oxygen tanks. Glaciers are shrinking at an alarming rate. The melting ice causes flooding downstream and the icefalls are more dangerous to cross. 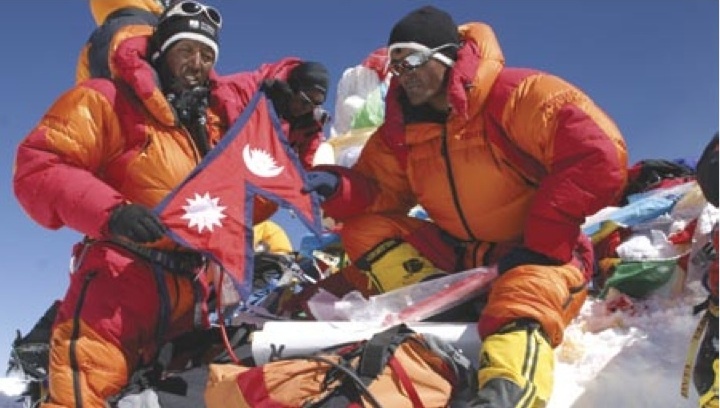 Apa Sherpa joined the EcoEverest team this year to highlight the problem of global warming.. He carried a sacred vessel called a “bumpa” from the Dalai Lama. It was his 19th record-setting climb. An increase in the number of inexperienced climbers is putting Sherpa guides at personal risk. The world celebrates when a new “first” is achieved; the first blind man to summit, the first person to ski down, the oldest climber, the youngest, etc. But those climbers are often tethered to a Sherpa who literally pulls them up the mountain one slow step at a time. This year a Sherpa was swept away in an avalanche. The foreign climbers he was guiding survived. I worry that the “status” associated with climbing Mount Everest is not weighed against the “human cost” to the Sherpa guides who take them there. I listed links to these resources as well as videos clips, interactive content, and supplemental material in the back of the book. I have also posted them on my website. What were the challenges and rewards of writing Sacred Mountain? What to leave on the “cutting room” floor. I was lucky to work with editors who became fascinated by the material and the direction I was taking. So the book grew to forty-eight pages – higher than our original target, and there was still quite a bit of information we were not able to include. 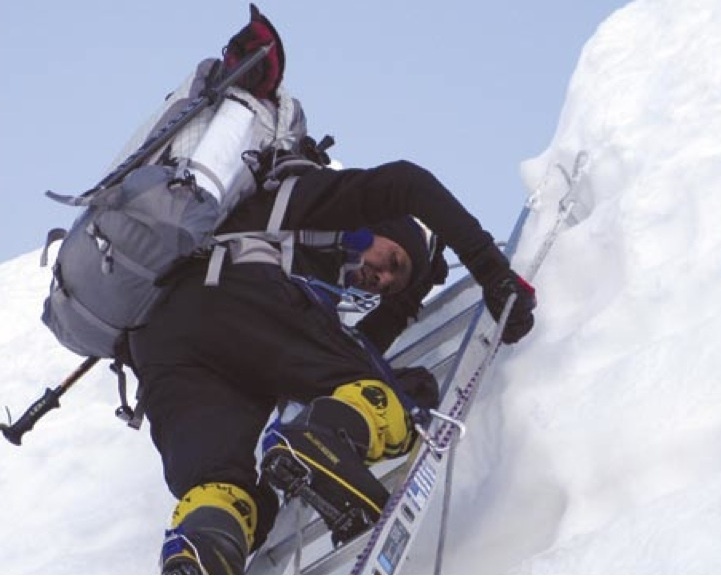 For instance, a section on the IMAX team filming the Everest movie. The supply manifest was huge and a smaller camera had to be designed that could withstand the cold. It still weighed close to forty pounds. That expedition was guided by Jamling Norgay – the son of Tenzing Norgay. Jamling’s book, TOUCHING MY FATHER’S SOUL touched my heart as well. Researching the language and assembling a phonetic pronunciation guide for the glossary was hard. Jerry Mika of SuperSherpas provided an early draft of a Sherpa dictionary being developed. I also listened to audio interviews of people from the region. I could not – given the age of the target readers – address how many people die each year and what happens to the bodies. Of course that is the FIRST question boys ask during school visits. I have to be honest and say they are left on the mountain in most cases. It’s too dangerous to bring them down. My greatest reward? Creating something that adds to a body of knowledge and making it accessible for a student. The pairing of the text with the beautiful photographs provided by Apa Sherpa, Jerry Mika and many others. Working with an amazing group of editors and book designers. It took a true village to make this book happen. In writing the book, you wove many aspects of the mountain together — history, economics, ecology, people. How did you organize all of your material and bring it together in a clear and engaging way? A lot of diagrams, spreadsheets and 3×5 cards. Books, magazines and note paper were spread all over my office or tacked on the walls. I’m tactile and needed physical materials that I could move around until I found the proper order for the final outline. But again – a lot of data doesn’t make for a compelling narrative. I had to immerse in the human aspect – the people’s relationship to the mountain. I was fascinated by the Sherpa’s desire to reclaim their mountain for themselves. The all-women climbing teams drew my attention because women are often left out of books about Everest. So I gave the Sherpa climbing expeditions a chapter of their own. The response from librarians and teachers has been tremendous. I began getting calls to speak at school and library events after the book was released. I also joined a group of nonfiction authors to present booktalks at the ALA convention in Chicago. We expected 50 people at our session. We got close to 300. Copies of Sacred Mountain sold out at Lee and Low’s booth before my second scheduled signing. It was thrilling to see Sacred Mountain included on the Allen County Public Library’s Mock Newbery nomination list. The competition is fierce and it is an honor to be considered among so many amazing authors. What tips can you offer others interested in writing non-fiction? Research, research, research. Read as many primary sources as you can before you write a single word. This includes books, magazine articles, interviews, journal entries, scholarly dissertations. Screening your sources is important because there is a lot of contradictory material both in print and on the internet. Keep extensive notes and bibliographies, even in a book with a much lower word count. It helps to footnote early drafts to keep track of sources in case an editor asks for clarification. It is not uncommon for a fact-checker or copy editor to suggest text changes based on information they found elsewhere. One wrong fact and the book’s credibility is down the drain. Lastly – define a point of view. It’s impossible to include everything you find in your research. So ask yourself – “what is the heart of my story?” If you can define that, it will be easier to focus on what is important for the project at hand and park the rest for another book or article in the future. What’s your dream for Sacred Mountain? A parking lot filled with work-in-process manuscripts. I’m finishing the first draft of a contemporary YA novel that takes a controversial subject and turns it on its ear a bit. For more about Sacred Mountain: Everest, please visit the Sacred Mountain and Lee & Low Books websites. For more about Christine Taylor-Butler, please visit http://www.christinetaylorbutler.com/. Isn’t that just the truth. What a wonderful book, amazing pictures, and what an extraordinary people. This is a neat project. This is truly fascinating. I truly never thought about the other side of the Everest climb, ever. I think this is especially for children to read so they can put into perspective, once more, how fortunate a good deal of the population is. But more than that, the Sherpa’s mission to protect the mountain, even at risk of their own lives, is powerful. I’ve read it and it’s an incredible book. Congratulation, Christine! Thanks so much for giving the back story on this book. Non-fiction books are only as good as the research that goes into them and this one looks great! I would like say congratulation, Christine. A truly interesting story of Mt. Everest and mountain people Sherpa. This is a book I will be sharing with my nephew Jaden and I know he will definitely enjoy it. He is only in the second grade, but his interest lies in people, places and things which I enjoy exploring with him. Amazing photography! Congratulations, Christine, on the success of your book! Thanks for sharing your knowledge on such an interesting topic . . . I will definitely be on the lookout for this at the library. Fascinating! Thank you for this important story. You have certainly raised my awareness, and I can’t wait to share your book with my family. Congratulations on such a fantastic achievement. What a wonderful book Christine! There is so much information included in this book. I am sure all readers will be fascinated by the wealth of information. Congratulations to you and best wishes in all your endeavors!